things that shine: Cocoa Daisy sneaks! Don't forget, reveal is tonight at 9 pm for subscribers! 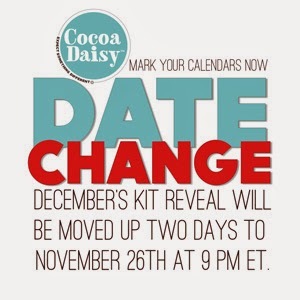 Join us at Cocoa Daisy tonight for reveal. I'm hosting... there are RAKs and lots of fun chatting! Even if you aren't a subscriber, stop in and say hi and you might win on one of our RAK threads! The exclusive Cocoa Daisy patterned papers this month.. think I am in love! Feeling inspired by this kit to try to scrap our November photos as our first month of a family of six. Fun with numbers with (part of!) one of the Cocoa Daisy stamps this month! A few layouts in progress, and one always-messy desk! It's going to get glittery here!